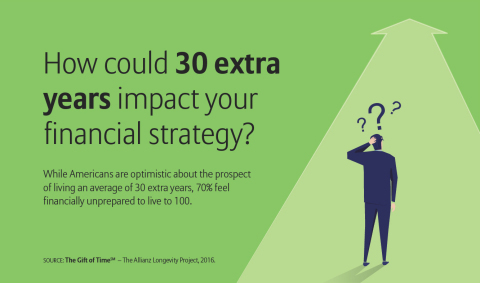 MINNEAPOLIS--(BUSINESS WIRE)--While Americans are optimistic about the prospect of living an average of 30 extra years, 70% feel financially unprepared to live to 100 and beyond, according to The Gift of TimeSM*, a new study from Allianz Life Insurance Company of North America (Allianz Life®). The study found that fears surrounding money and a lack of planning are formidable barriers that keep people from taking risks and following their dreams. Despite these barriers, Americans have a clear understanding that preparation, self-discipline and a longevity plan are the keys to longer, more fulfilling lives. Millennials and Generation X have time on their side when it comes to pursuing their dreams, but that gift comes with significant angst. More than three-quarters (79%) of Gen Xers reported feeling financially unprepared for living a longer life while 74% of Millennials had the same concerns. Baby boomers are not immune to worry either – 57% reported that they feel financially unprepared. When respondents were asked to finish the sentence, “following your dreams is all well and good, but you need to have…,” the top two barriers chosen were “enough money” (57%) and “a good financial plan” (50%). The biggest regret reported (or potential future regret for Millennials) was not saving more money (52%) which ranked above not traveling more (38%) and not spending more time with their kids (32%). As respondents considered their extra years, 45% said that “uncertainty” most closely described their feelings about the future. This uncertainty is echoed by the fact that more than half (51%) identified “having enough money to last my whole life” as a very big problem when they thought about living to age 100. In contrast, the study also showed people’s awareness of solutions that could help. Building the right financial foundation can help alleviate challenges holding people back. According to the study, more than half (51%) of respondents believed they would need to better plan their spending and saving, or live more modestly to fund all the things they want to do in life. More than a third (37%) even acknowledged that they may need to work longer/retire later to meet their financial needs. To make the most of their 30 extra years, respondents found it important to change the amount of money they save, how they fund their entire life (including short-term goals), and the level of discipline they need to follow a financial plan. In addition to the solutions people identified when planning for longevity, the study found that having a financial professional could add support and reassurance. Respondents who had a financial professional reported being happier (79%) with their major life choices (such as their profession and when/where they worked or didn’t, etc.) compared to 64% of those who were happy with their major life decisions but did not have a financial professional. Despite that fact, the majority (72%) of respondents reported not having a financial professional. But these respondents would be more willing to seek one if the financial professional helped them find solutions that could create guaranteed income for life (47%), helped plan for and fund a longer life (34%), and helped with finances throughout life stages (31%). “No matter the age, getting help to establish the right longevity plan can build a foundation that meets both long- and short-term goals. This gives people the chance to do things they’ve always wanted to do, like be a stay-at-home parent or pursue a different career,” said Libbe. Americans also support living life in a new, nontraditional order – especially if the barriers holding them back are addressed. When asked what got in the way of following a different approach for when and how they made major life decisions, “worries about money” was the top choice for 46%, “life events” got in the way for 33%, and 22% cited “lack of a clear plan for how to go about it” or “fear of failure” getting in their way. With the right longevity plan, people who avoid making alternative choices because of money could reconsider their future, as many respondents recommended doing. Sixty-five percent admitted that it was better to explore, experiment and travel earlier in life by changing when and how they learned, worked, married or raised kids. The Gift of Time found that instead of taking a traditional path (going to school, working, getting married, having kids and retiring), almost half (49%) of respondents were open to a nontraditional model that was unique to their interests. “Having 30 extra years opens the door to taking a nontraditional life path. Now, more than any other time in history, people can create a strategy that gives them the chance to live their adult lives on their own terms – not according to traditional or societal standards,” concluded Libbe. For more information about the study and to see examples of people embracing longevity and choosing their own nontraditional life path, visit www.allianzlife.com/TheGiftofTime. In the coming months, Allianz Life will release additional data from The Gift of Time Study. *The Allianz Life The Gift of Life Study was conducted by Larson Research + Strategy via online survey in March, 2016 with 3,000 U.S. adults ages 20-70 with a minimum household income of $30K+ and was commissioned by Allianz Life. While Americans are optimistic about the prospect of living an average of 30 extra years, 70% feel financially unprepared to live to 100 and beyond, according to a new study from Allianz Life.